This summit will provide information on topics including local broadband planning, funding and engagement with service providers. 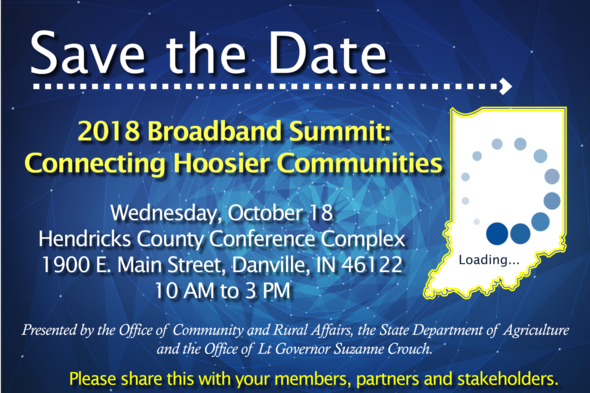 Speakers and attendees from local governments, state agencies, federal agencies and broadband providers will come together to explore ways to facilitate the expansion of broadband capacity, access and utilization throughout the state. This summit is presented by the Office of Community and Rural Affairs, the State Department of Agriculture and the Office of Lt. Governor Suzanne Crouch. If you have any questions, email Melissa Thomas, Communications Manager for Office of Community and Rural Affairs.